Accordingly, in August, 1779, Captain Jones put to sea once more, this time with a fleet of four vessels. He named his flag-ship Bon Homme Richard (bo-nom′-rē-shär′), after the Richard of Poor Richard’s Almanac, which you will remember Benjamin Franklin had written. In this ship, which was old, he set out to cruise along the western coast of Ireland, in order to capture English merchant vessels. After reaching the southern point of Ireland, he cruised northward around Scotland and down its eastern coast. Then he sailed up and down the eastern coast of England, looking for merchant vessels. 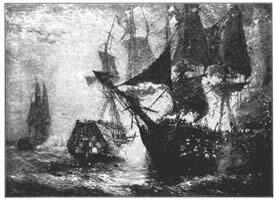 At noon on the 23d of September Jones sighted a fleet of forty-two merchantmen, guarded by two English ships of war, all sailing from the north. He at once decided to make an attack. This took place early in the evening, the action being mainly between the Richard and the English man-of-war Serapis, which was a large ship, new and swift, and very much better than the Richard. As the British vessel came alongside his own for a more deadly struggle, Jones with his own hands lashed the two together. Soon both were badly leaking, but the fighting went on as fiercely as ever. Presently both caught fire. Then Jones turned his cannon upon the mainmast of the Serapis, and when it threatened to fall the English captain surrendered. So after all it was the English ship and not the American that “struck” the flag. But the Richard could not have held out much longer, for even before the surrender she had begun to sink. This was a desperate sea duel, and it lasted from half past seven in the evening until ten o’clock. It was important also in its results, for it won much needed respect for our flag and gave a wonderful uplift to the American cause. The victor, John Paul Jones, who was loaded with honors, from that day took rank with the great sea captains of the world.